Announced on the LexCon facebook page comes word that Yuta Mochizuki known for his role as Tyranno Ranger in Kyoryu Sentai Zyurager has sadly had to cancel his LexCon appearance for this year. Mr Mochizuki has become severely ill and unfortunately can’t make the trip to the states for now. 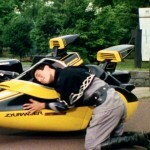 The silver lining to this sad situation though is that another Zyuranger actor will be taking his place. None other than Aohisa Takayasu AKA Mammoth Ranger! We certainly send our best wishes to Mr. Mochizuki and hope for a swift recovery, in the interim though be sure to head to the Lexington Comic & Toy Con from March 13th-15th to meet Mr. Takayasu! Well, we have some good news and some bad news. We just learned a few days ago that Yūta Mochizuki had become seriously ill earlier this month. He is now recuperating in Japan, and his doctor has advised against traveling until he is well. Unfortunately, we have to agree. If attending LCTC didn't mean a 17-hour flight from Tokyo, it might be a different situation but it's just too risky for him at this point. Mochizuki-san was truly looking forward to seeing all of you in Lexington, and is very sorry to have to cancel his appearance at this time. He hopes to make it up to everyone next year. The good news is that our friends in Japan have worked overtime in order to bring AOHISA TAKAYASU, Mammoth Ranger from ZYURANGER, to Lex Con this year. Mr. Takayasu will be appearing together with his SUPER SENTAI teammates Takumi Hashimoto (Tiger Ranger) and Reiko Chiba (Ptera Ranger) for the first time ever in the USA, so please join us in welcoming him to Lexington! That is sad to hear about Mochizuki but I hope he feels well soon. It is nice to see another Zyuranger actor coming over. I hope people give them a warm welcome. Ah, no! I hope Mochizuki-san gets well soon. Oh, I don't think that'll be a problem. Hope Yuuta Mochizuki gets well soon and I hope this trend of more sentai alumni joining these cons continue and eventually have rider and other toku franchise alumnis gradually join the club. I do sometimes hope Sotaro or Hosogai Kei make guest appearances as they both speak English. Speaking of Sotaro, did you guys know that he was in a Steven Segal flick and his older brother in real life was the actor who portrayed B-Fighter Kuwaga? I hope Mochizuka-san gets better soon.